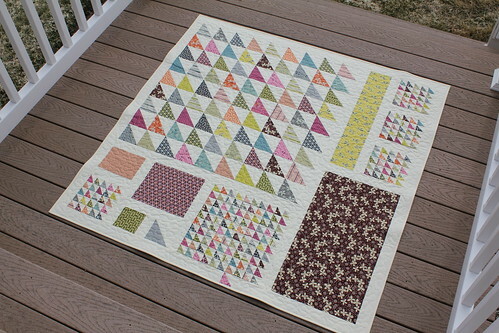 My Hope Valley half square triangle quilt is now finished. This is the second quilt that I have done on my HQ 18 Avante. I'm still experiencing some annoying thread breaks and tension issues. I'm told that this is all a matter of making proper, minute adjustments to the machine; time and trial and error will tell! I'm fairly comfortable with machine stippling as I have been doing this for years on my domestic machine. I'd like to branch out and work on some other continuous line quilting patterns however until my machine and I are on the same page, I'm going to stick with what I know. I think it's time to get some inexpensive muslin and spend a few hours of unbridled practice until I'm sure that I have the bugs worked out. 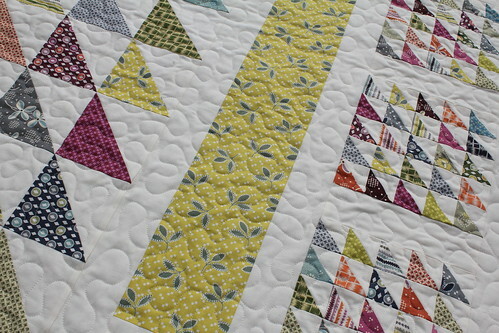 I mixed a few pieces of whole cloth into this quilt, this helps to make a larger top without putting in much more effort. 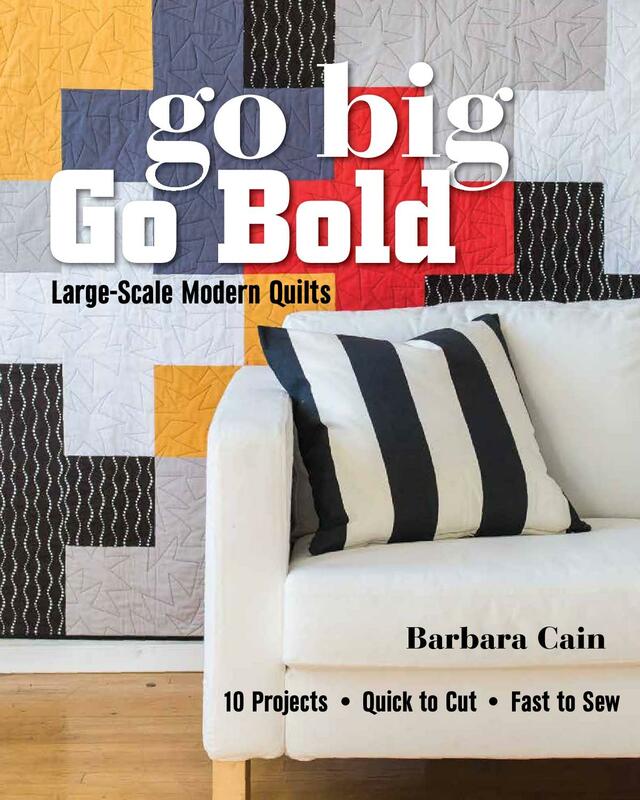 I always laugh when I say things like that; quilting is supposed to be an enjoyable hobby for me and I am forever looking for ways to make it faster and easier on myself. My cat Dumpling always appreciates my quilts. I'd like nothing more than to see her curled up in this one right now however, that won't be happening. Poor Dumpling (nearly 17 now) has not been feeling well and after a trip to the emergency vet yesterday, she will staying in the kitty hospital for a little while. Our hopes are that she pulls through however we do understand that she is an old girl and nearing the end of her life. Hopefully she'll make it home for a comfortable nap. Wow I love your quilt. I have a thing for hope valley and this is stunning. Well done. 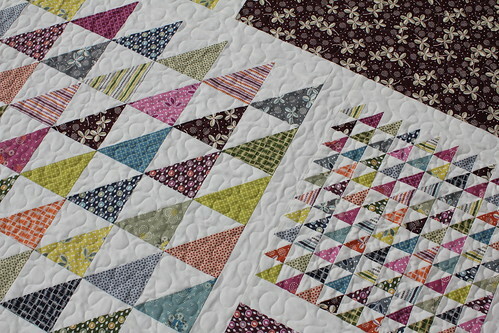 Great Job on this quilt! 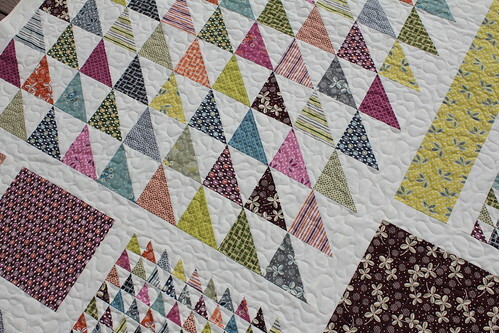 LOVE the varied triangle blocks! !